The story of The Elephant Hills started in 2005 when we had a vision to turn an ordinary house into a place where people can come to experience true hospitality, relaxation, good food and wonderful surroundings at an affordable price. We’ve come a long way since then and have expanded into a 25 room, luxurious Guesthouse that is well positioned for both business and leisure travelers. The Elephant Hills is situated in the up-market residential area of Meerensee, cradled between the warm Indian Ocean and Lake Mzingazi (Meerensee literally means “lake and sea” in Afrikaans, one of South Africa’s 11 official languages). Richards Bay is well known for its sub-tropical climate all year round, making it one of the most popular tourist destinations in South Africa. The rich history of the area is well known, being in the heart of Zululand and about a two hour's drive from Durban, also known as The Last British Outpost in South Africa and history buffs frequently tour the battlefields of the Zulu Kings Shaka and Dingaan scattered all over KwaZulu-Natal. 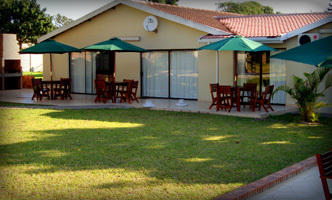 We are literally a stone’s throw away from the Richards Bay Country Club with its 18-hole championship golf course on the banks of Lake Mzingazi where crocodiles and hippos are often spotted, not to mention the abundance of birdlife and monkeys in these lush natural surroundings. A variety of beaches are within 10 minute’s drive from our Guesthouse with an assortment of water-sports like jet skiing, canoeing and deep-sea fishing charters. For those travelers who prefer to get away for the romanticism, sundowner cruises can be arranged from the Tuzi Gazi Waterfront by yacht daily. Safari enthusiasts can pack their binoculars and head off to either the Enseleni Game Reserve or the Hluhluwe Game Reserve both within a comfortable drive from Richards Bay as well as The St.Lucia Wetland World Heritage Site, that draws thousands of tourist annually and is a must see when visiting Zululand.